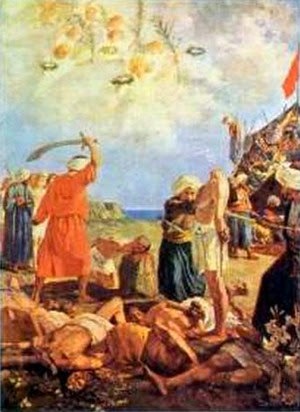 The contemporary Turkish historian Ibn Kemal claimed that the slaughter occurred because the inhabitants, en masse, would not convert to Islam. Modern historians are more inclined to believe that the slaughter was a punitive measure, without religious motivation, exacted to punish the local population for the stiff resistance they put up, which delayed the Turkish advance and enabled the king of Naples to strengthen local fortifications. It would also have been a warning to other Italian cities what to expect if they chose to resist and were defeated. They martyrs were beatified in 1771 and were canonized by Pope Francis on 12 May 2013 with their feast day set as 14 May. They are the patron saints of the city of Otranto and the Archdiocese of Otranto. On 28 July 1480 an Ottoman force commanded by Gedik Ahmed Pasha, consisting of 90 galleys, 40 galiots and other ships carrying a total of around 150 crew and 18,000 troops, landed beneath the walls of Otranto. The city strongly resisted the Ottoman assaults, but the garrison was unable to resist the bombardment for long. The garrison and all the townsfolk thus abandoned the main part of the city on 29 July, retreating into the citadel whilst the Ottomans began bombarding the neighboring houses. According to an account of the story chronicled by Giovanni Laggetto and Saverio de Marco, the Turks promised clemency if the city capitulated but were informed that Otranto would never surrender. A second Turkish messenger sent to repeat the offer “was slain with arrows and an Otranto guardsman flung the keys of the city into the sea.” At this the Ottoman artillery resumed the bombardment. A messenger was dispatched to see if King Ferdinand of Naples could send assistance. 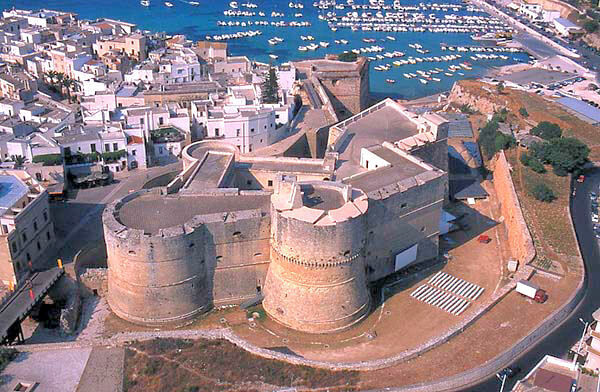 As time went on “Nearly seven-eighths of Otranto’s militia slipped over the city walls and fled.” The remaining 50 soldiers fought alongside the citizenry dumping boiling oil and water on Turks trying to scale the ramparts between the cannonades. On 11 August, after a 15-day siege, Gedik Ahmed ordered the final assault, which broke through the defenses and captured the citadel. When the walls were breached the Turks began fighting their way through the town. Upon reaching the cathedral “they found Archbishop Stefano Agricolo [ Stefano Pendinelli ], fully vested and crucifix in hand” awaiting them with Count Francesco Largo. 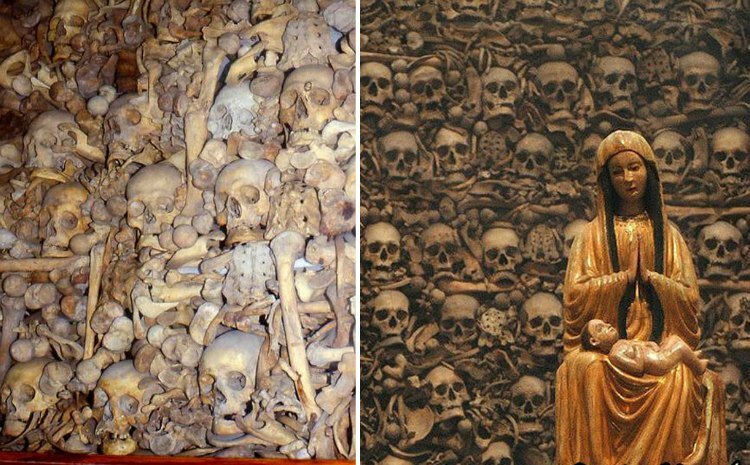 “The archbishop was beheaded before the altar, his companions were sawn in half, and their accompanying priests were all murdered.” After desecrating the Cathedral, they gathered the women and older children to be sold into slavery in Albania. Males over 15 years old, small children, and infants, were all killed. According to some historical accounts, a total of 12,000 were killed and 5,000 enslaved, including victims from the territories of the Salentine peninsula around the city. 800 able-bodied men were told to convert to Islam or be slain. A tailor named Antonio Primaldi is said to have proclaimed “Now it is time for us to fight to save our souls for the Lord. And since he died on the cross for us, it is fitting that we should die for him.” To which those captives with him gave a loud cheer. On August 14 they were led to the Hill of Minerva (later renamed the Hill of Martyrs). There they were to be executed, with Primaldi to be beheaded first. After the blade decapitated him “his body allegedly remaining stubbornly and astonishing upright on its feet. Not until all had been decapitated could the aghast executioners force Primaldi’s corpse to lie prone.” Witnessing this, one Muslim executioner (whom the chroniclers say was an Ottoman officer called Bersabei) is said to have converted on the spot and been impaled immediately by his fellows for doing so. Between August and September 1480, King Ferdinand of Naples, with the help of his cousin Ferdinand the Catholic and the Kingdom of Sicily, tried unsuccessfully to recapture Otranto. Seeing the Turks as a threat to his home, Alfonso of Aragon left his battles with the Florentines to lead a campaign to liberate Otranto from the Ottoman invaders beginning in August 1480. The city was finally retaken in the spring of 1481 by Alfonso’s troops supported by King Matthias Corvinus of Hungary’s forces. 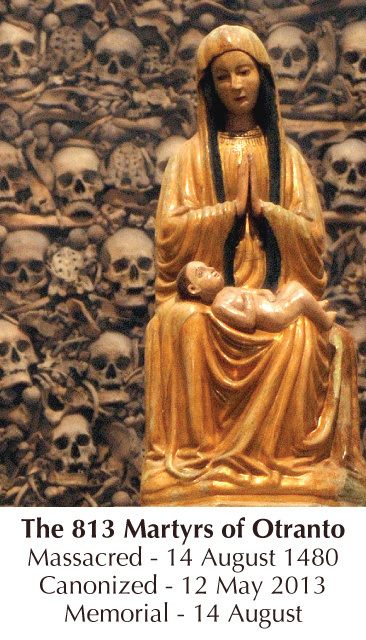 The skulls of the martyrs were placed in a reliquary in the city’s cathedral. On 13 October 1481 the bodies of the Otrantines were found to be uncorrupted and were translated to the city’s cathedral. 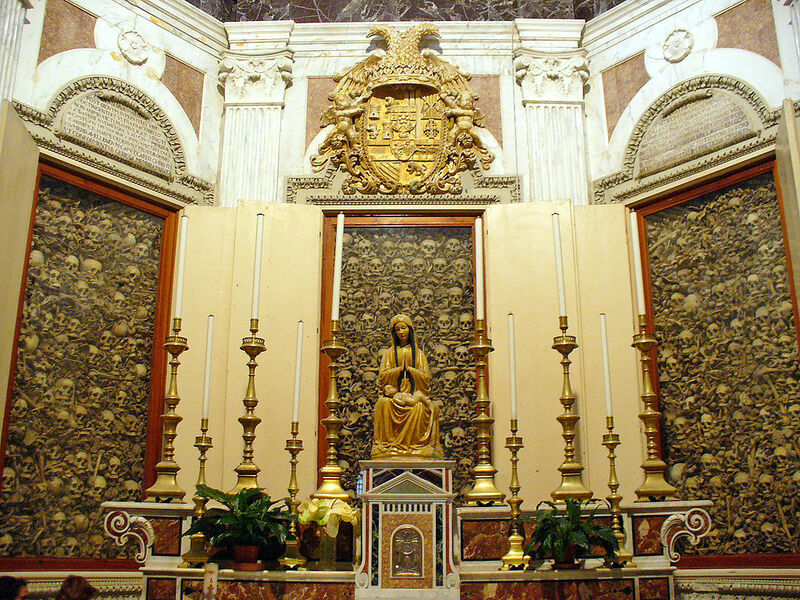 From 1485, some of the martyrs’ remains were transferred to Naples and placed under the altar of Our Lady of the Rosary in the church of Santa Caterina a Formiello, an altar that commemorated the final Christian victory over the Ottomans at Lepanto in 1571. They were later moved to the reliquary chapel, consecrated by Benedict XIII, then to a site under the altar where they are now located. A recognitio canonica between 2002 and 2003 confirmed their authenticity. A canonical process began in 1539. On 14 December 1771 Pope Clement XIV beatified the 800 killed on the Colle della Minerva and authorized their cult. Since then they have been the patrons of Otranto. On 6 July 2007, Pope Benedict XVI issued a decree recognizing that Primaldo and his fellow townsfolk were killed “out of hatred for their faith” The martyrs were canonized on 12 May 2013 by Pope Francis. The announcement of the canonization was made on 11 February 2013 by Pope Benedict XVI in the consistory in which Benedict also announced in Latin his intention to resign the papacy. Some modern historians, such as Nancy Bisaha and Francesco Tateo have questioned details of the traditional account. Tateo notes that the earliest contemporary sources describe execution of up to one thousand soldiers or citizens, as well as the local bishop, but they do not mention conversion as a condition for clemency. Bisaha argues that more of Oranto’s inhabitants were likely to have been sold into slavery than slaughtered. However, other historians, such as Paolo Ricciardi and Salvatore Panareo, have argued that in the first year after the martyrdom there was no information about the massacres in the contemporaneous Christian world, and only later — when Otranto was reconquered by the Neapolitans — was it possible to get details of the massacre from the local survivors who saw it. Their memories may or may not have been accurate, and they are certainly not directly recorded. Some version of a salt cod dish (known under some cognate of baccalà) is known throughout the coastal regions of Italy, Spain, and Portugal. Salentine baccalà is regionally famous in and around Otranto. The addition of tomatoes and black olives make it distinctive. Soak the salt cod in water for at least 48 hours, changing the water regularly. In a deep, heavy skillet or Dutch oven, sprinkle a little extra-virgin olive oil followed by a thin layer of breadcrumbs. Then add a layer of potatoes and season with salt and pepper to taste. Then add a layer of chopped tomatoes, followed by a layer of sliced onions and olives with a seasoning of oregano and grated pecorino cheese. Sprinkle the dish with a little olive oil. Cut the soaked cod in chunks and lay it on top of the dish. Add another layer of potatoes, then onions, then tomatoes, olives, and seasonings, finishing with a topping of breadcrumbs and cheese sprinkled with olive oil. Bake the dish for around 45 minutes. Turn off the oven and leave the dish in the oven for another 10 to 15 minutes. Serve with a green salad and crusty Italian bread.